Born 07 June 1813, Redmond Barry was from a family who had long ties in Ireland. He was born at Ballyclough, County Cork, Ireland, and sailed for Sydney on the Calcutta in 1839. Travelling to the Port Phillip district he was admitted to the Supreme Court on 12 April 1841. Redmond Barry died in 1880, aged 67. Judge Redmond Barry presided over the Eureka State Treason Trials, except for John Joseph and John Manning which were presided over by Sir William a'Beckett. Redmond Barry is best known for being tough in his sentences, and for sentencing Ned Kelly to death in 1880. He helped found the University of Melbourne and the Ballarat School of Mines. 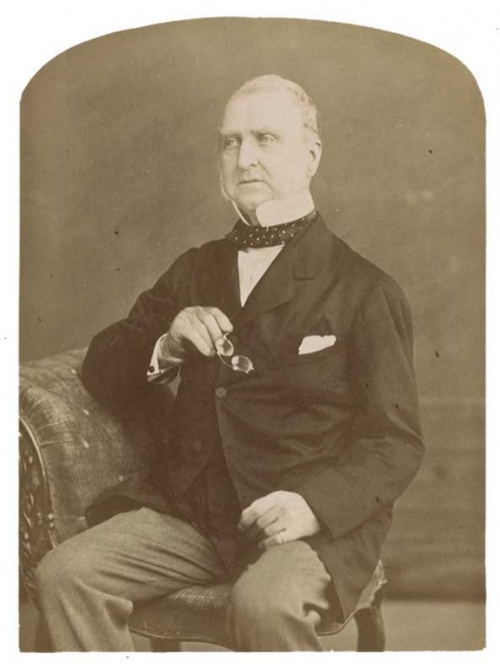 He was leading mover in the establishment of the State Library of Victoria. He received a knighthood in 1860, and in 1880 he was the judge who sentanced bushranger Ned Kelly to death. THE LATE MR. JUSTICE BARRY. The death of Mr. Justice Barry, referred to elsewhere, leaves a blank in tho list of old and useful colonists which will not be easily filled. His Honor was one of the oldest civil servants in the Australian colonies. In addition to the discharge of his judicial functions he had sought earnestly and disinterestedly to aid in all philanthropic enterprises, and to promote the establishment and maintenance of such institutions as the Melbourne University, the Public Library and the National Gallery and' Museum, with which his name must ever be associated. His Honor was born in 1813 at Ballyclough, in the county of Cork, Ireland. His father was Major-General Henry Green Barry, the representative of a distinguished Irish family, claiming to be descended from Wilham de Berry, whose antecedents date back to the mythical period of Irish history. Without particularising upon the point of ancient line age, it seems indisputable that the Barrys from whom the late judge descended are intimately connected with' the family of which Lord Barrymore was tho head, and that they were lineally and by intermarriage connected with some of the best houses of tho old country. Sir Redmond, it is said, was intended in the first instance for the military profession, but being disappointed in this respect his friends suggested that he should study for tho bar. In 1833 he became a graduate of Trinity College, Dublin, the Alma Mater of thou sands of Irishmen, who either finding their country too small or too warm to hold them, have been scattered over the face of the globe to wield their swords, their tongues or their pens for the livelihood unattainable at home. His Honor appears to have gone through his academical course with credit, and we find that in 1838 he was called to the bar in Ireland. Shortly afterwards he emigrated, and in 1839 arrived in Sydney, where he qualified himself to act as a barrister, and immediately sailed for Melbourne. At this period Victoria was known as Port Phillip, a distant province or appanage of New South Wales, but it was growing into notice, increasing in population, and assuming a social importance which necessitated the mother colony foregoing many of its claims for regulating the local wants of the district; At this date all civil cases had to be taken to the Supreme Court of New South Wales to be tried — an arrangement which involved the utmost inconvenience to the litigants residing in Port Phillip. 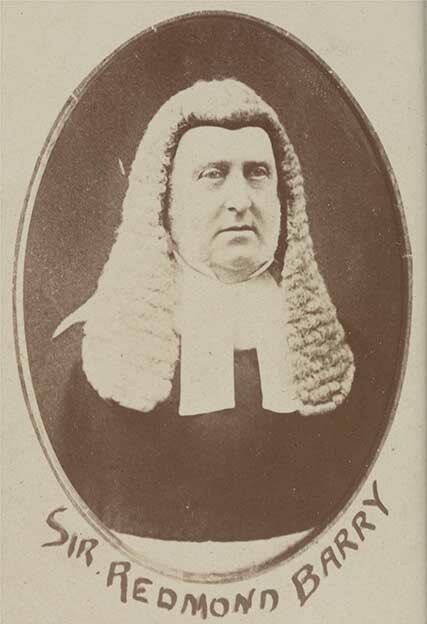 Urged by frequent representations, the Government o£ New South Wales consented to the establishment of two new tribunals in Melbourne, one being a branch of the Supreme Court in that colony and the other a Court of Requests, of which Mr. Barry, the subject of our sketch, 'was appointed a commissioner. Mr. Redmond Barry's practice at the bar was not interfered with, and professionally he was regarded as very successful. When in 1851 Victoria was separated from New South Wales he was appointed Solicitor-General by Governor La Trobe, and in that capacity was a member of the Legislative and Executive Councils. In the following year he was appointed puisne judge of the Supreme Court, of which Mr. A'Beckett was chief justice. Sir Redmond Barry had therefore occupied a leading position on the judicial bench for over a quarter of a century. In 1862 he was accorded the honor of knighthood, and some years later had confer red upon him for. public services the order of K.O.M.G; Although connected with many popular movements, and associated with our loading institutions, Judge Barry ever maintained a character free from the suspicion of partisanship. His memory claims respect at the hands of his follow colonists for public virtues of tho very highest order. His whole desire appeared to have been to elevate the intellectual standard of the community. To his efforts mainly we are indebted for the foundation of the Melbourne University. That institution was opened in 1855, when, in recognition of his active serviced, his Honor was elected chancellor, a position which he worthily maintained to the close of his earthly career. Much, of the success which has attended the establishment of the Melbourne Public Library is solely due to the never-ceasing exertions of the late judge. His Honor was not satisfied with rendering that noble institution the mere receptacle of a heterogeneous collection of works from all quarters of the globe. He was desirous of making it the nursery of colonial intellect, where might be found authentic sources of the great facts of history from which future writers might take their data and be enabled to hold their own against the litterateurs of Great Britain and Europe. One great object of his ambition appeared to have been to procure for our Public Library a complete set of works, which, in themselves, would present a verification of Gibbon's history of the Decline and Fall of tho Roman Empire. This seems to have been the darling object of his Honor's intellectual life for many years past ; and when it is remembered what that includes, as only the earnest student of Gibbon can comprehend, it will be admitted that the learned judge had undertaken the work of a lifetime. Gibbon, the historian, had set before him tho astounding enterprise of bridging over the dark period of history extending from the decline of the Caesars' sway in Rome contemporaneously with the incipiency and early development of Christianity to the incursions of tho Turks in Europe and their establishment in Byzantium in the fifteenth, century, when the whole complexion of European civilisation became completely changed. In dealing with the intermediate period, and conveying anything like an intelligible conception of the factors at work, the historian had to undertake a task truly herculean; and no thing could bettor display tho superior powers and literary capacity of the late judge than his efforts to collect in our library tho vast stores of knowledge from which Gibbon, the historian, drew his facts and inspiration. ↑ Illustrated Australian News, 4 December 1880.